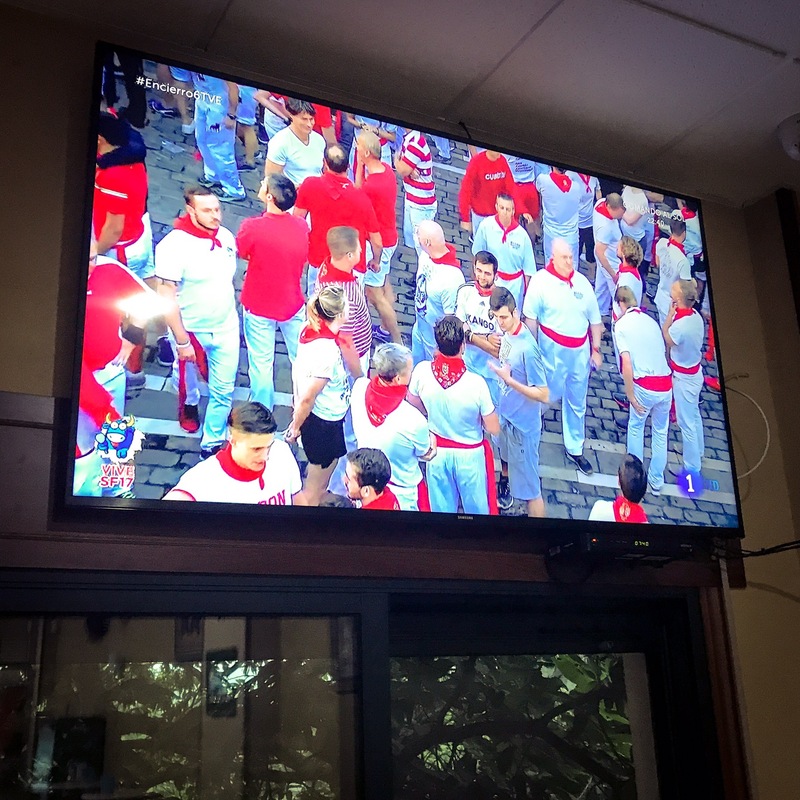 Totally unrelated to the Camino de Santiago, but Mikey has been following the Pamplona’s San Fermin festival rather closely this year. No, he’s not into bullfighting, but this is the first time he has been in Spain during the festival. This screen (like most others right now in Spain) is focused non-stop on Pamplona. 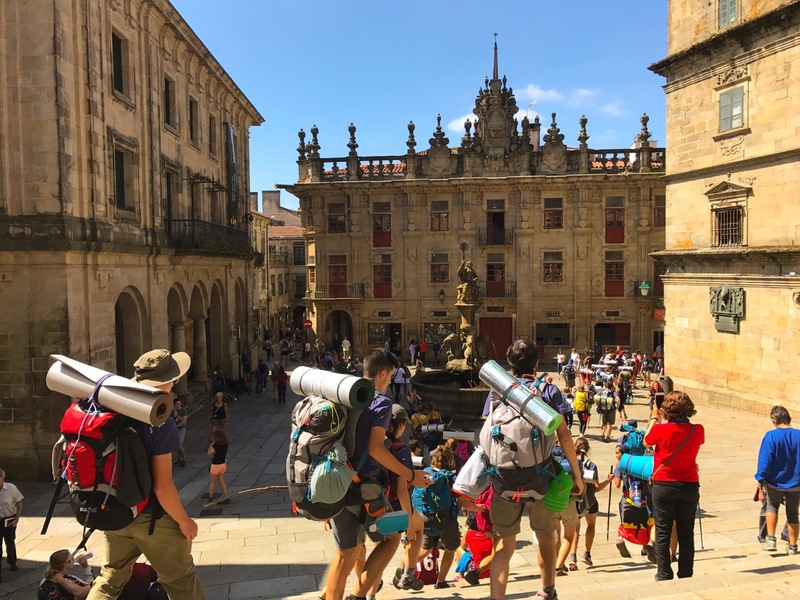 While Mikey is no longer a fan of bullfighting, at least Pamplona’s Corridas or “Running of the Bulls” gives them a chance to nab a few tourists on their way to the slaughter. It felt like a corrida today! 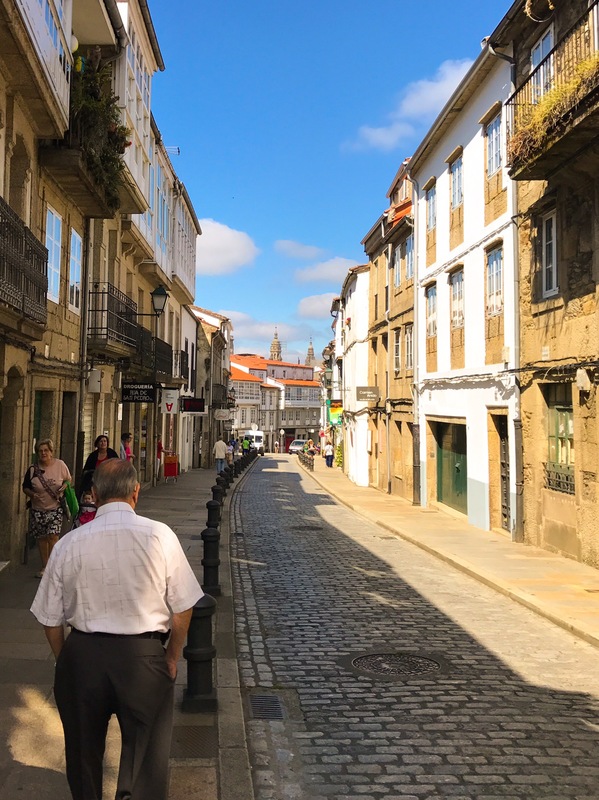 Even considering that we were the last to leave the albergue and then had a leisurely coffee breakfast, there were still hundreds of pilgrims vying to arrive in Santiago before noon mass. This wasperhaps the one landscape shot absent pilgrims that Mikey captured. 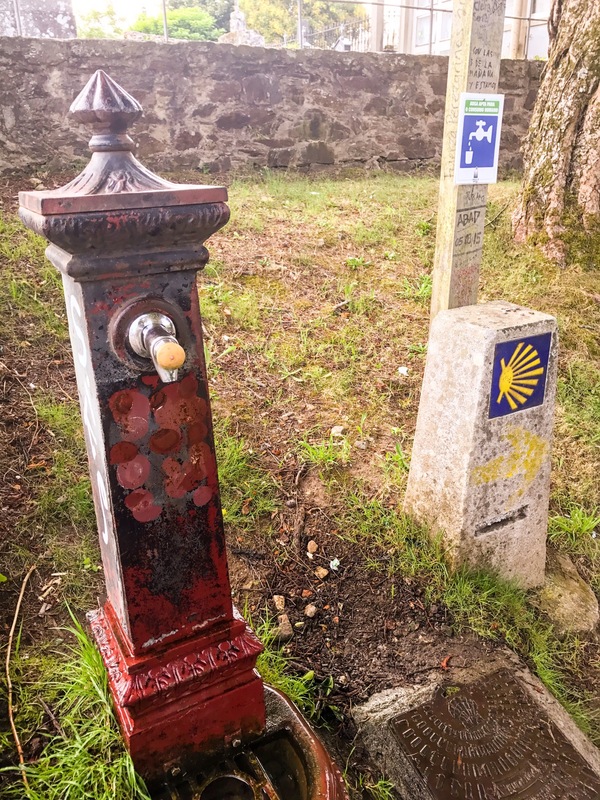 If you check out Frank and Mikey’s camino from last year, you’ll recognize this marker just before he airport. Yes, we were trying to get to the Cathedral for mass, but some things shouldn’t be rushed. 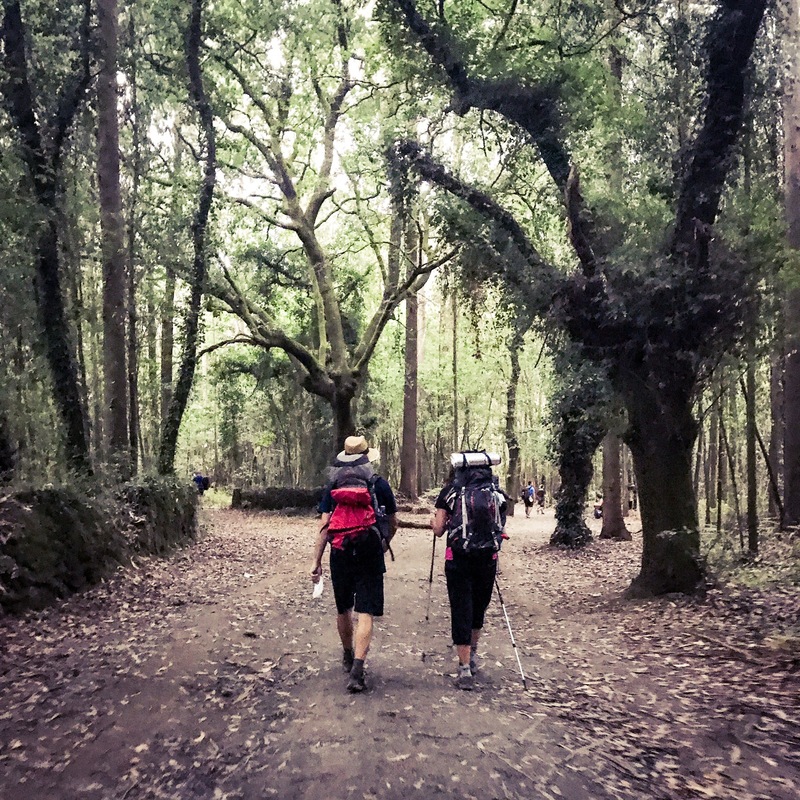 Oh, and considering that this was our last Camino break, the picture turned out well. 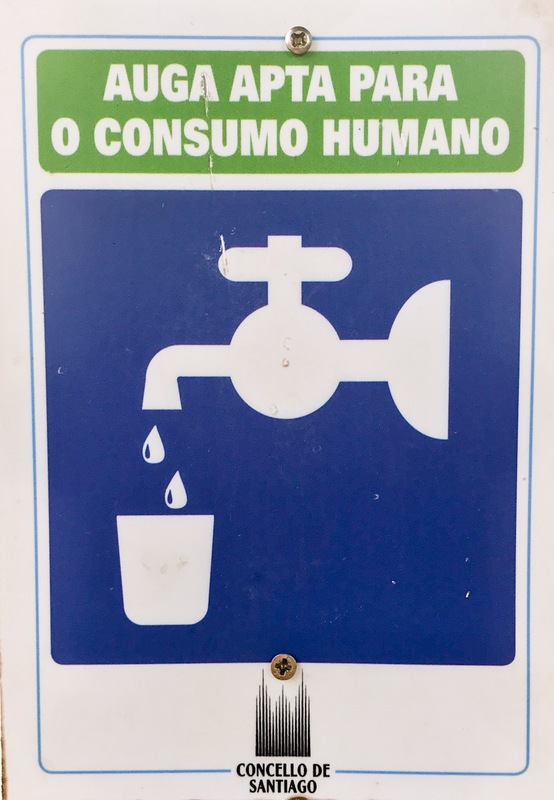 So, there! 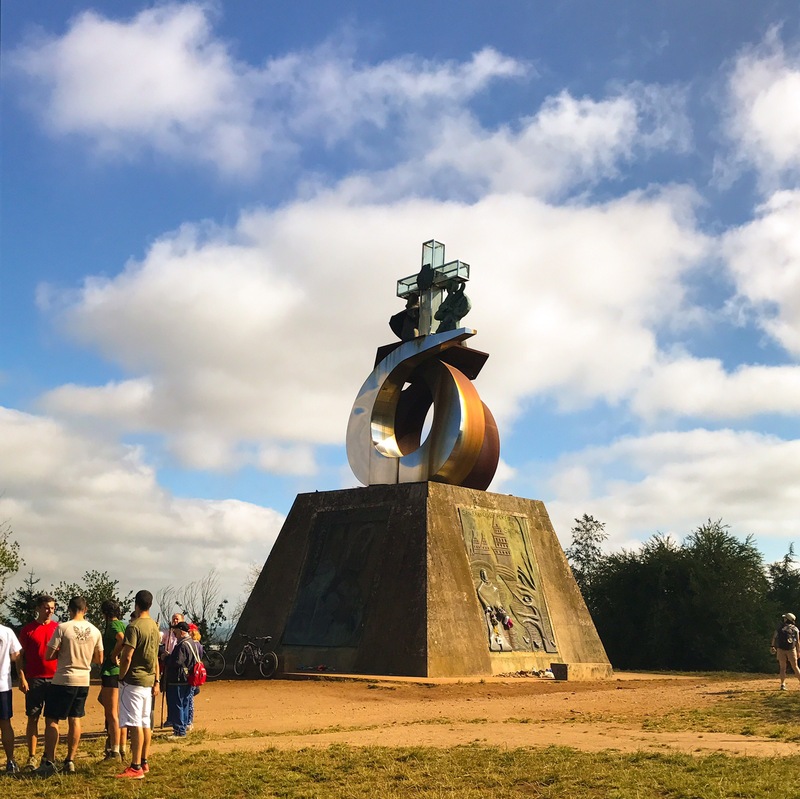 On Catholic Youth Day in August, 1989, Pope John Paul II led a pilgrims’ mass on the hilltop of Monte de Gozo (the Hill of Joy) which overlooks Santiago de Compostela. 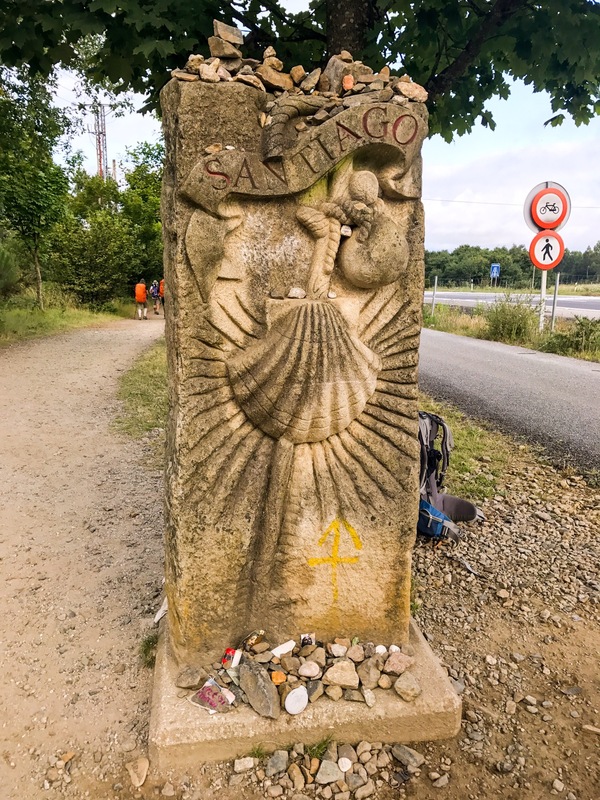 To commemorate the event, an odd statue was erected and has ever since divided the populous with young people loving it and older “Camino-purists” abhorring such a scourge on the last stage. Still, all are agreed upon the horribly utilitarian and barracks-like albergue nearby. 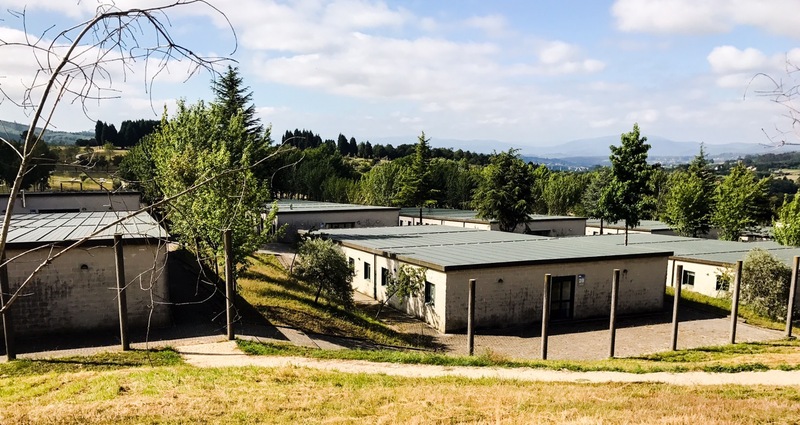 What it lacks in aesthetic appeal is redeemed in function as the campus can house 400 pilgrims during regular Camino seasons and up to 800 or more in holy years. Alas, no time for stopping. It was noticeable how everyone’s pace increased the closer we got to both the cathedral and noon. 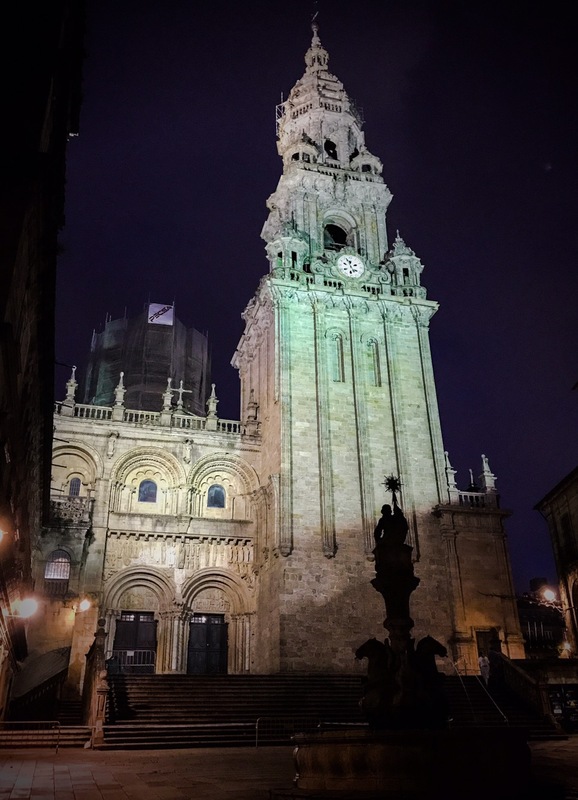 Mikey snapped a picture of his first view of the cathedral’s bell towers. 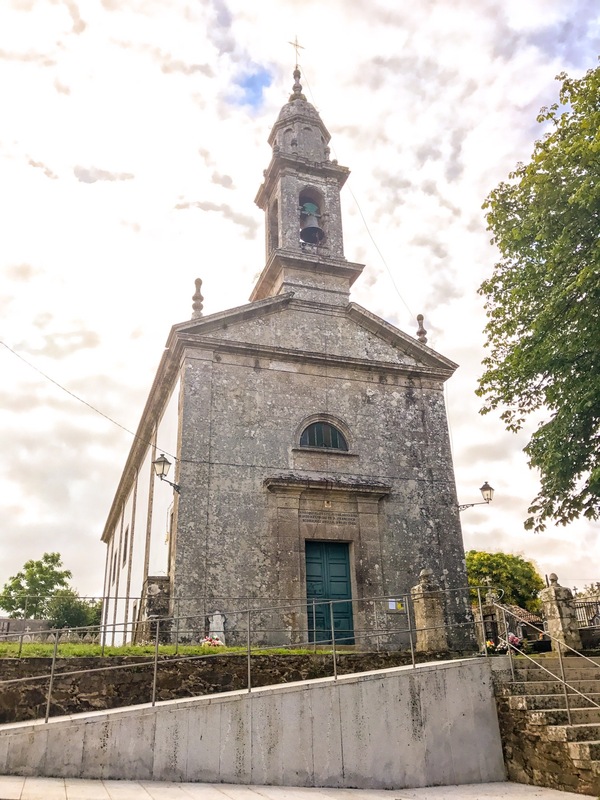 Since backpacks are not allowed in the cathedral and there was not enough time to drop his at the hotel, Mikey went to the post office and paid 2€ to check his bag. 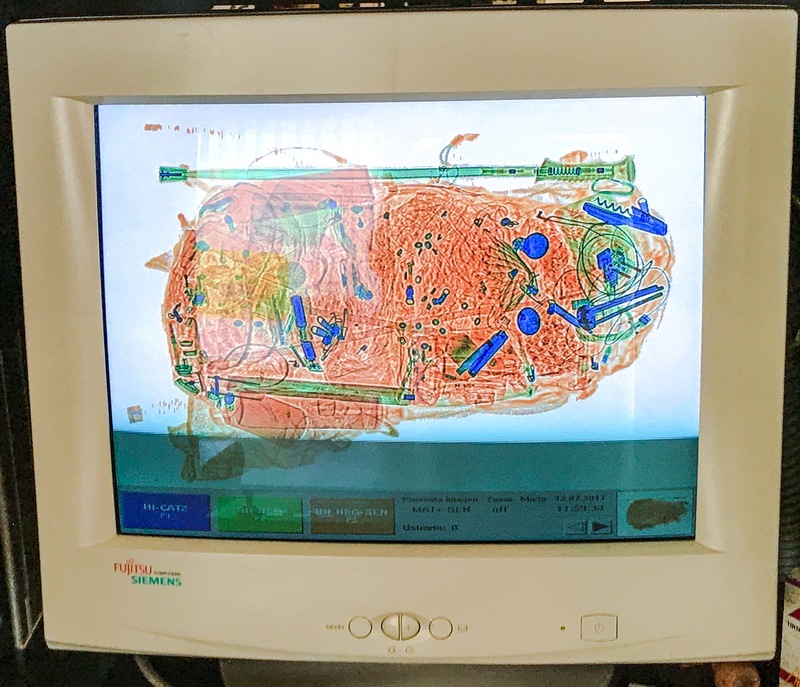 OK – this was just fun seeing the ex-ray of his pack. Can you spot the wine key?! At long last, we arrived at the cathedral with a few hundred of our fellow pilgrims. Mikey b-lined it for the entrance and made it there by the start of mass. And then he saw the line of people waiting. It took about 40 minutes, but he got in just before the botafumeiero was lit. https://videopress.com/embed/dsbsb1Sf?hd=0&autoPlay=0&permalink=0&loop=0https://v0.wordpress.com/js/next/videopress-iframe.js?m=1435166243​In olden days, pilgrims were housed within the cathedral complex. Due to all the smell (perhaps they breezed by Lavacolla? ), a huge incense burner was swung to purify the mass. Think of it as the medieval version of Glade or AirWick swinging at 68kph (42mph)! If only the credential line moved as fast! 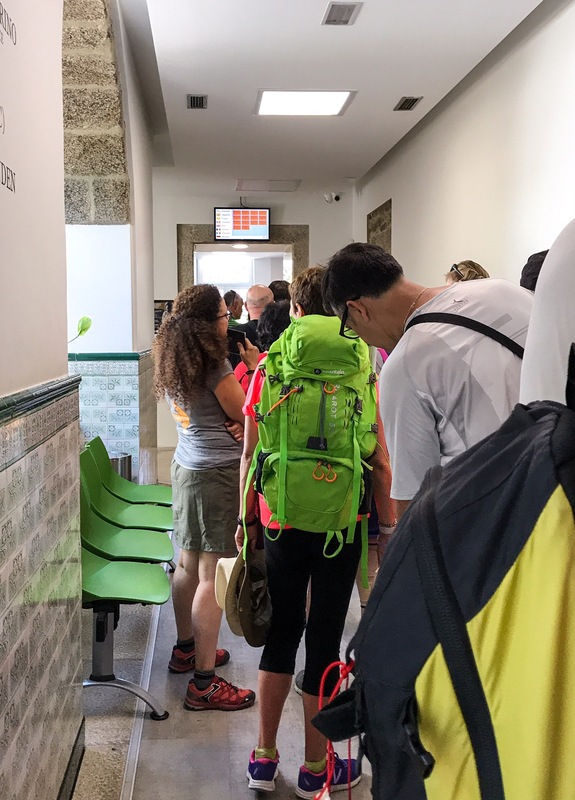 Some 45 minutes later, Mikey had moved to the front of the line and secured his official Compostela marking the Church’s recognition of his pilgrimage. 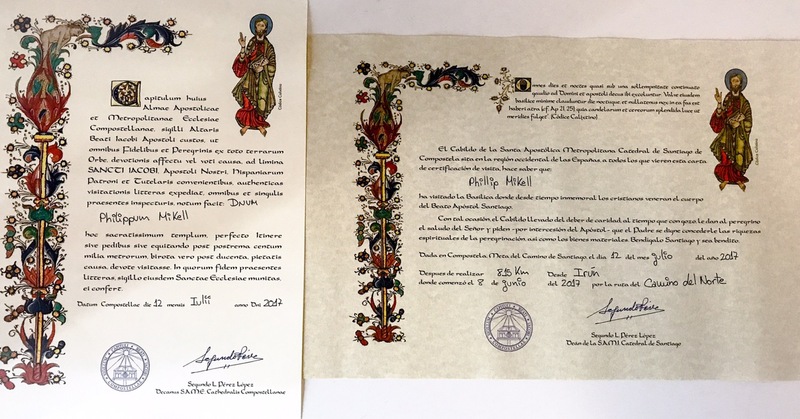 The first document is written in latin and the second is a distance certification attesting to his completion of 815km. Yeah, right – Fitbit disagrees with such a lowball number! 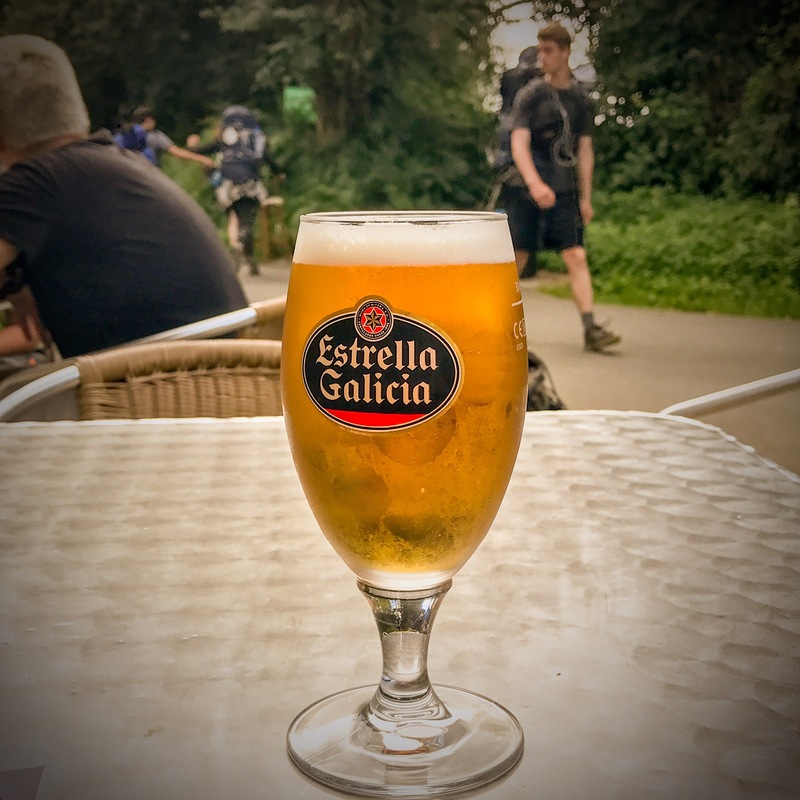 815km or more, there are definitely lots of treats to make up for those calories burned along the Way. 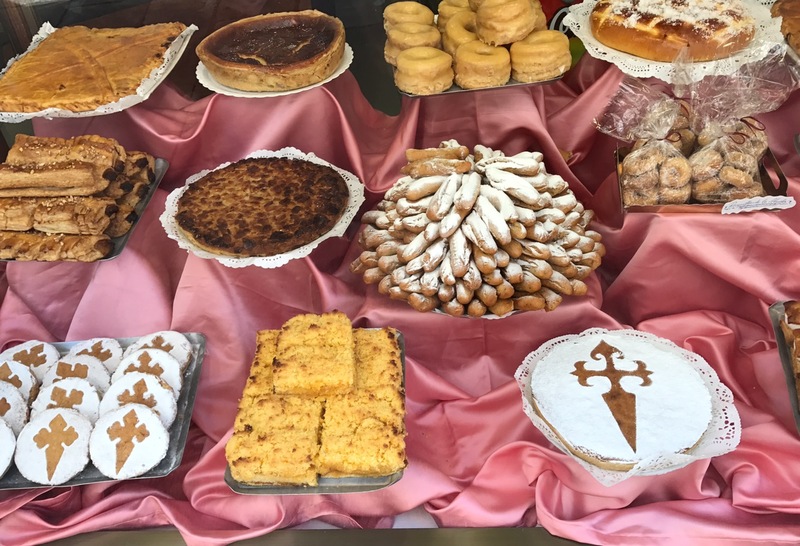 Most iconic is the Torta de Santiago (“Saint James Cake”) which is a tasty almond cake covered in powdered sugar amd sporting the crusader cross. 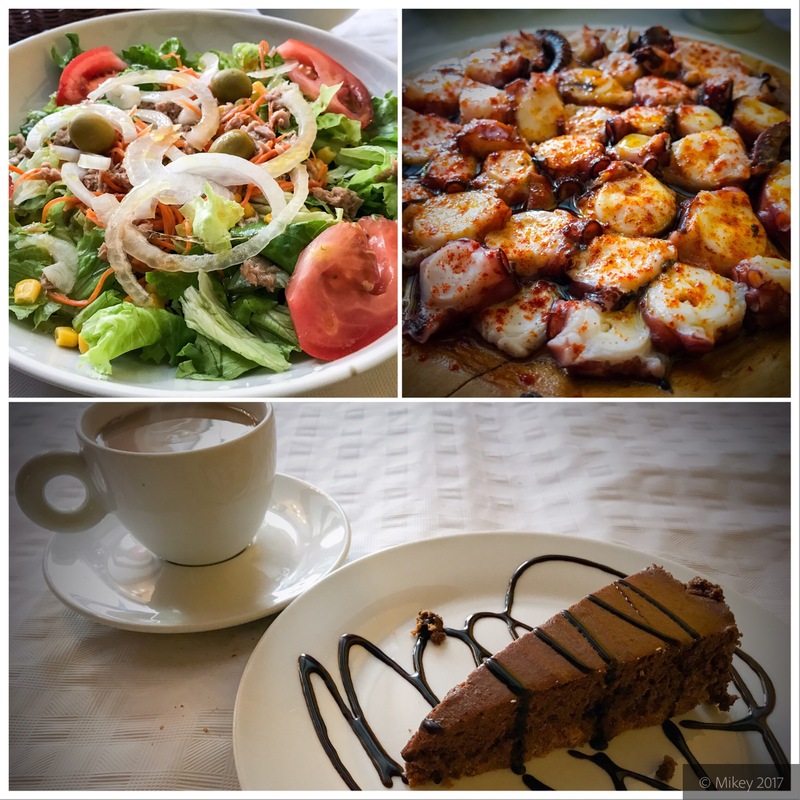 But, Mikey decided to take the plunge and have an entree salad, octopus, chocolate cake, and coffee. With wine and bread it was 12€! And then there was a beer tasting. Once again, the beer store only had one set for flights, so Mikey had to hurry before passing the taster board on to the next customer. Today was most definitely a physical, mental, and emotional rush. Given all the excitement, Mikey headed to the hotel and washed some clothes before heading to bed. 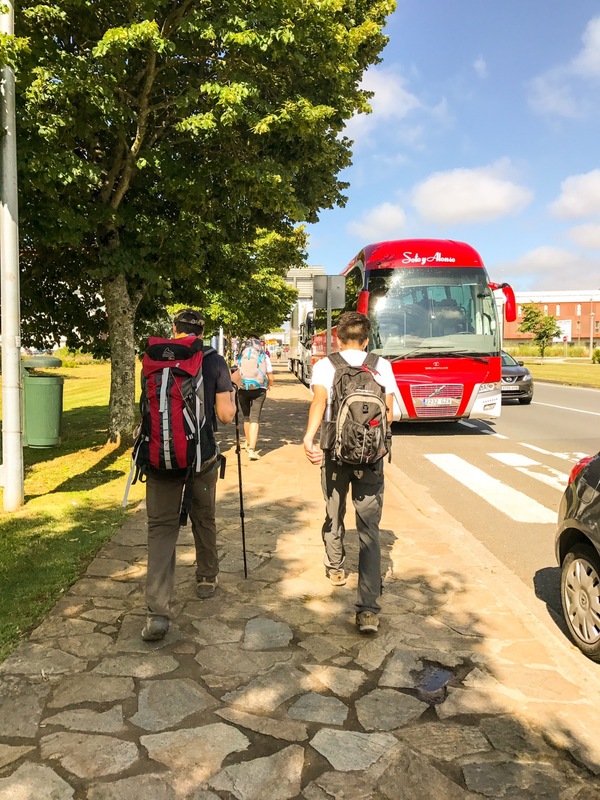 I guess it hasn’t all sunk in yet that he just walked across Spain – again. The Pilgrim Passport is now complete. Each of the 39 stamps tells a story. Each look over the array of places journeyed elicits a plethora of memories. Thank you to all those who stamped my passport. This is definitely a most prized possession. 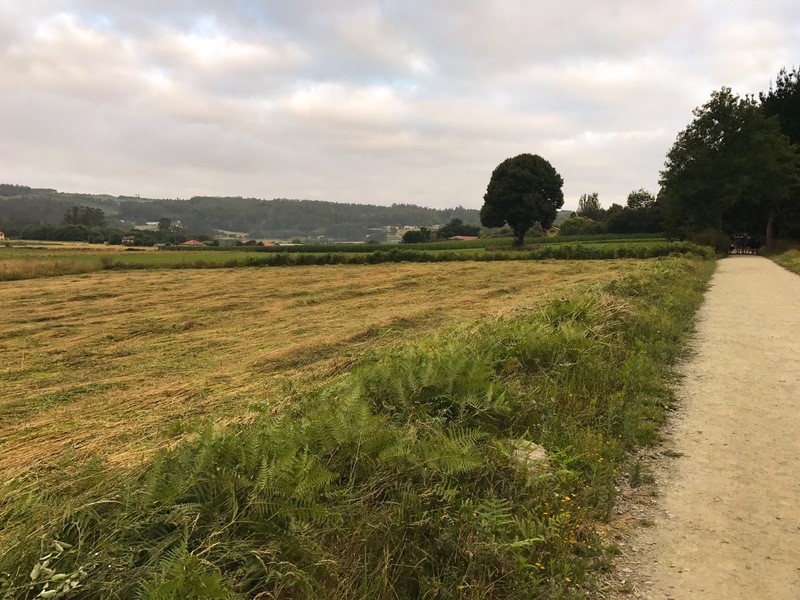 Goodnight from journey’s end: Santiago de Compostela!